I promised in my Once-a-Month Grocery Shopping Unloading and FAQs video that I would also share my monthly meal planning system for my large family. Here it is! If there’s anything I missed or if you have any questions just leave those below. This post contains affiliate links which help support the work of this site. I’ve had success with meal planning a variety of ways over the years. I’ve meal-planned in advance for just dinners. I’ve created meal plans for the week. I’ve done meal planning that planned enough food for it to be served as dinner two nights in a row. I’ve meal-planned on my small dry erase calendar in my kitchen. I’ve recorded my meal plans on my Evernote App on my iPhone. I’ve written out meal plans on calendars from the Dollar Tree. I also created these free meal planning printables a few years ago. I’ve found the best way to meal plan is the way that works for you! Some seasons all I can do is plan out meals for the week, a week in advance. Other seasons, for time and sanity sake, I plan out a month of meals in advance to correlate with my once-a-month grocery shopping trip. When I’m in the throes of 3rd trimester pregnancy, sometimes my meal plan has looked like sending my husband to the grocery store with a scribbled list that says something about cold cereal, lunch meat, and goldfish crackers. In my Large Family Meal Planning for the Month Video I share my current meal plan. 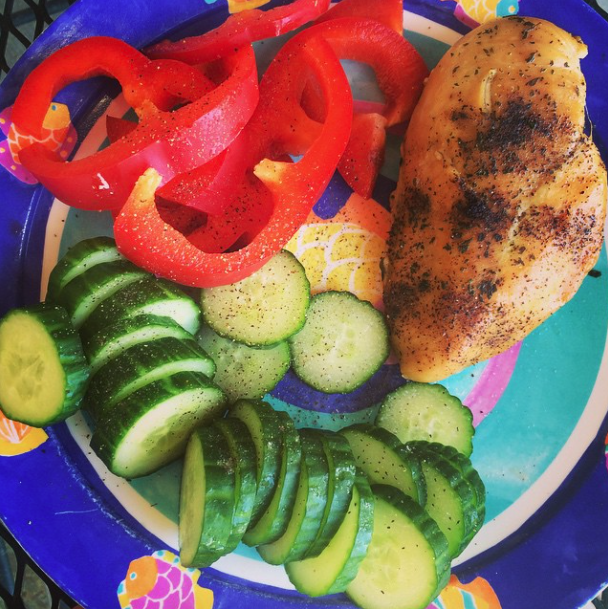 I rework this meal plan a few ways each month. For the most part, my ingredients stay the same, only the names of recipes change. 😉 Something new I’m trying this month, which I also mention in the video, is my new Laminated Jumbo Wall Calendar. It’s not a secret that I love dry erase boards for planning and scheduling. This calendar just made sense to me! Creating a meal plan for an entire month may seem overwhelming at first. In fact for some it is always overwhelming, and that’s okay. 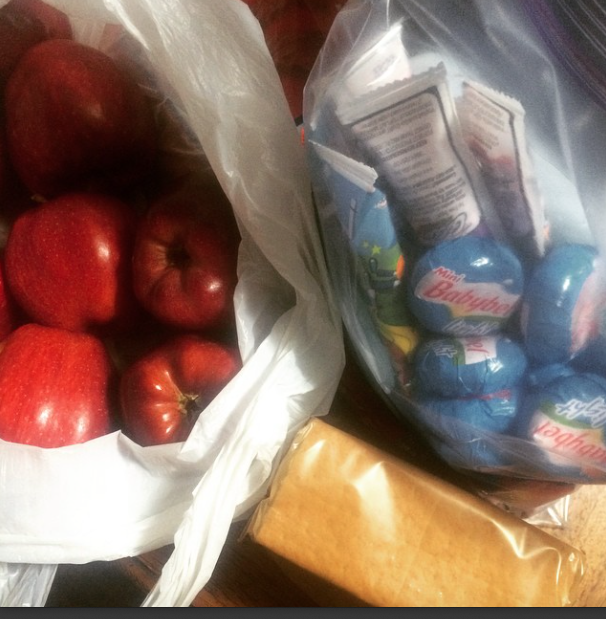 The first step that I suggest is to make your meal plan coincide with your grocery shopping trips. If you shop one week at a time make sure you have a meal plan in place that matches your grocery shopping list before you leave your house. It’s the same principle whether you shop bi-weekly, monthly, or every 6 weeks. Having a solid meal plan in place will save you money on groceries regardless of which pattern of shopping frequency you find yourself using. Dave Ramsey talks a lot about having your monthly household budget on paper, on purpose, before the month begins. I believe in this same principle for monthly meal planning. Having your meal plan written out on purpose saves money on groceries by allowing you to focus on only buying the meal plan’s needed items at the store. 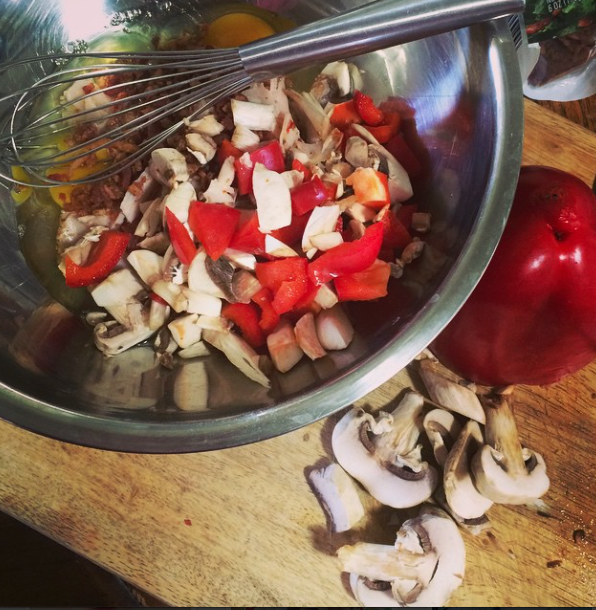 As I show you in the meal planning video, I plan out 21 meals a week for my family of nine. That’s 84 meals a month, plus snack choices, that are planned in advance. 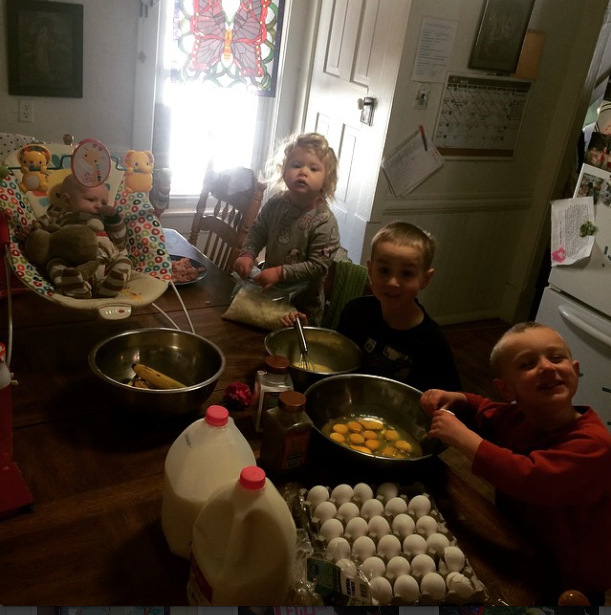 Our littlest ones helping make breakfast. Many of our breakfasts are old fashioned oatmeal with toast and/or fruit, eggs (cooked a variety of ways such as fried, scrambled, hard boiled, poached, or omelettes) again with either toast and/or fruit, breakfast burritos, and more. On Sundays I usually do an Egg Bake in the slow cooker or overnight oatmeal in the slow cooker. Lunch is the only meal I loosely plan for on the monthly meal plan. There are several variables that can affect lunch time. 1) We may have heavy leftovers from dinner the night before. If so, that’s lunch. 2) We may have no leftovers from the night before. If there’s no leftovers for lunch I may set out either freezer peanut butter and jelly sandwiches to defrost and accompany fruit for the children for lunch. Or, I may set out freezer burritos or muffins. You can see in the picture above that my lunches with leftovers don’t mean that anyone is deprived. Leftovers can be your friend! In this picture I reheated baked boneless/skinless chicken breast from the night before and added in red bell pepper and English cucumber. Delish and THM friendly! and of course making any of this into a silly FacePlate is extra fun! I do meatballs a few different ways. One of our favorite ways is meatball lasagna. Thursday Nights: One “official” Trim Healthy Mama recipe like Pizza Casserole, Cauliflower Pizza, Chicken Alfredo, THM Meatloaf, or my adapted Large Family Tuna Cakes. Saturday/Sunday: I do a large weekend bulk meal for every weekend. Saturdays are my long work days, and Sundays we’re running the roads for church. We need quick, easy, and already-made meals to make it work for our family. Two weekends a month I make a large pot of homemade chili. One weekend a month is a Taco/Taco Salad Weekend. One weekend is a spaghetti weekend (which I keep THM friendly by having my sauce over veggie noodles, etc.). Having a full large family meal plan in place allows me to know what I need to do for upcoming meals. I know by my monthly meal plan that we’re having tacos, chili, and spaghetti – all easy and family-favorite meals. 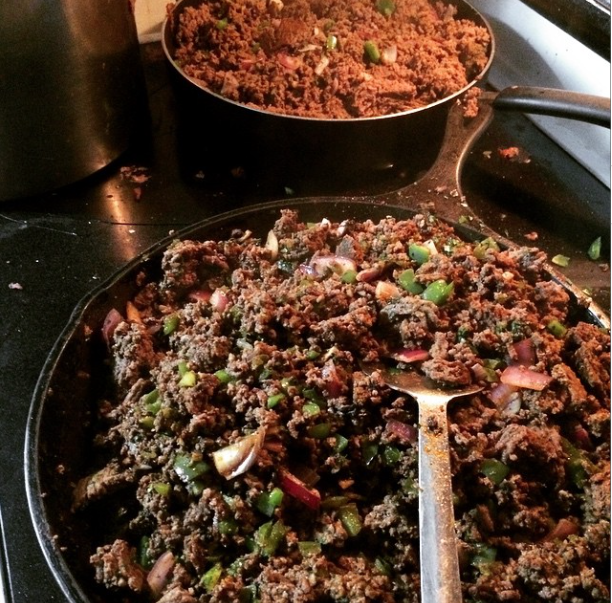 I took one afternoon and cooked up all of my ground beef for the month with the added onions, green peppers, mushrooms, seasonings, etc. After I had my once-a-month ground beef cooking time I filled ziplock freezer bags with the meat to pull out for needed easy meals throughout the month! Batch cooking ahead 15+ lbs of ground beef and sausage for upcoming chili and homemade spaghetti sauces. Another way I can prepare ahead of the month before the month runs over me is having a freezer cooking afternoon where we do things like make several dozen quick foods for lunch-time flexibility. Having a large family meal plan in place also gives me enough wiggle room to pack lunches or heavy snacks for family errand days or family day trips. On our last day trip, I packed our cooler with a large family lunch and snacks. Then we planned in our day trip budget to eat out at a buffet on the way home. This way we weren’t eating out all the way there and all the way home again. This is largely how I work our large family meal plan. Of course, certain details change each month. I try to mix in different recipes and once in a while throw in something new. A few months ago we tried making an entire month of Trim Healthy Mama friendly slow cooker freezer meals for dinner. Although I haven’t had the time for an 8+ hour freezer meal stretch lately, it was a good experience and I’d like to do it again at some point. 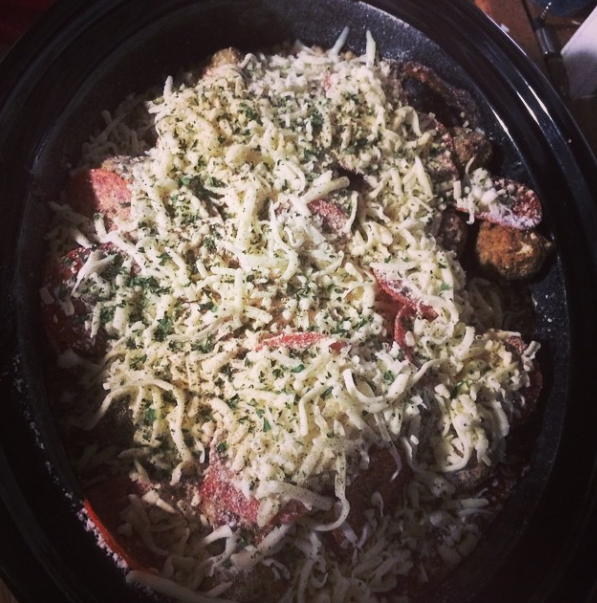 I continue to use my slow cooker in some form on most days. 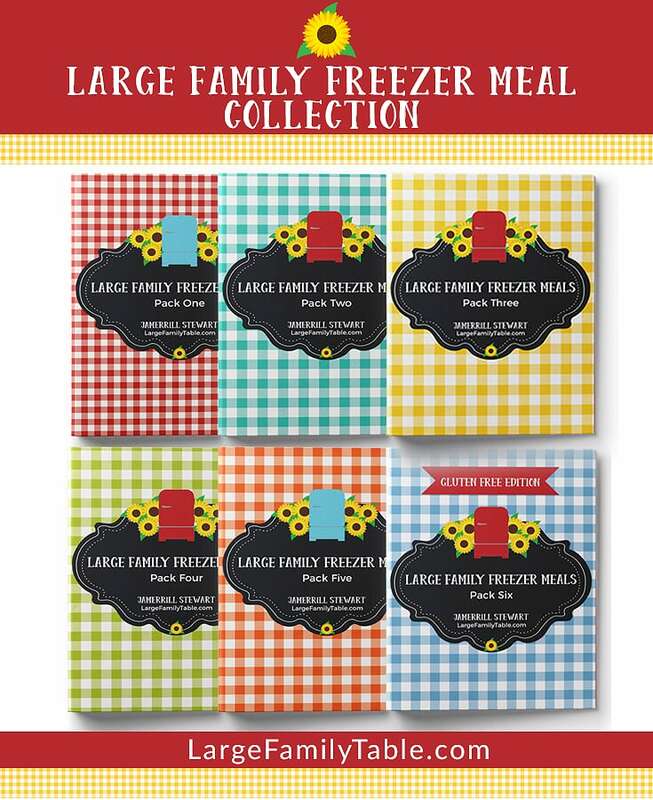 Share in the comments how your large family meal planning works! 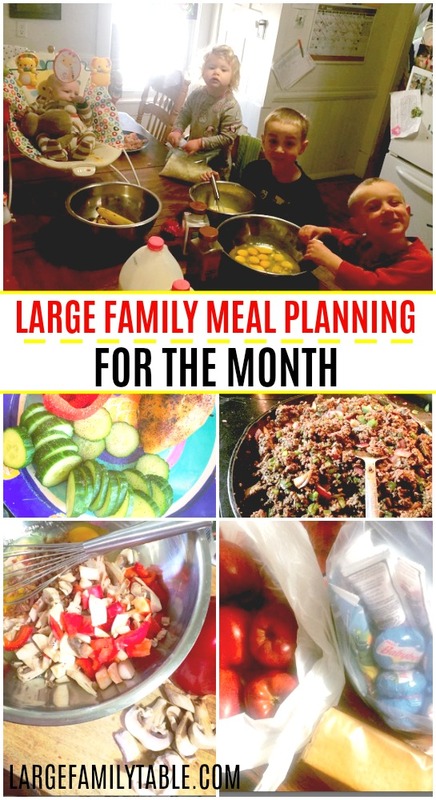 Here are more helpful resources to assist you in your large family meal plan efforts! Hi Jemerrill! Thank you so much for posting all of your great ideas! I only have 3 kids, but you have inspired me so much!! Planning is one of those things that I long to do, but don’t always accomplish. You make it look so easy! Hi, I was watching your video and looking at your meal plan/menu for the month and see you have roll often with you meals. What kind of roll is it and how do you make it? Ho Jammerill I dont have a large family but i love your website I was wondering ho I can save money on groceries in a rural area all we have is walmart which i despise and dollar tree and dollar general.My son has a dairy allegy so it is hard to make some of the lasagna meals and mexican.do you have any suggestions please!!!!!!!!! Do you cook anything on the grill in a hurry and if so WHAT?! I love your videos.I love the hauls.I wish I could do that.I would loveto go to Aldus and just let go.I would lovetobuy enough food andvnot go back to the store for months.I likekroger .they havethe veggiemeats.I have to buy for my family.they don’t eat meat.